Today’s pages were created by my daughter, Kathryn. She is a no frills scrapbooker. Her pages need to have lots of room for photos and there is always a long story to be written. The layout featured in the Balloon Ride Workshop on the Go Kit suited her style perfectly. The stamps in this kit are just beautiful. 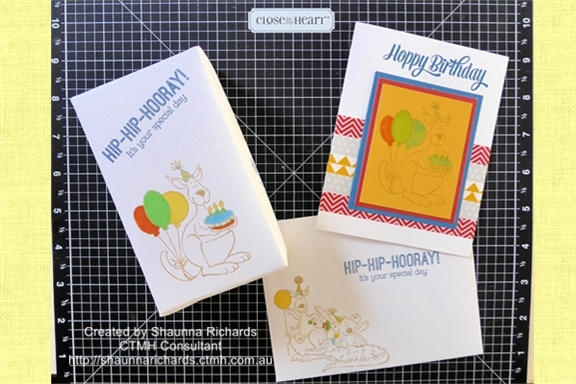 The sentiments will go well with so many themes and the dainty border and corner add subtle highlights to any pages. 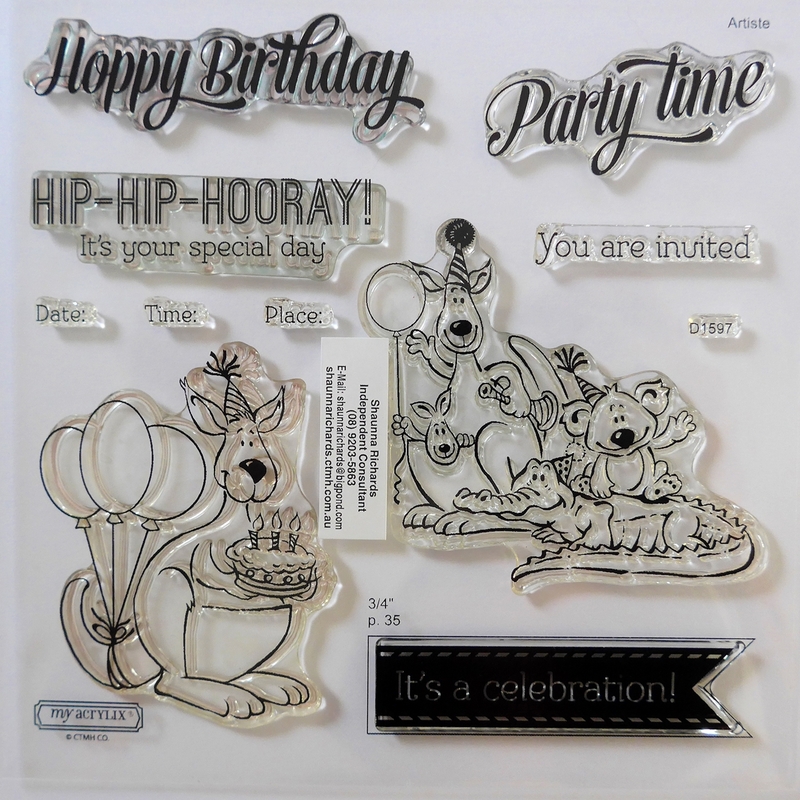 I love the stamp and franking lines – they add some fun. I can picture a journal box made to look like a postcard. 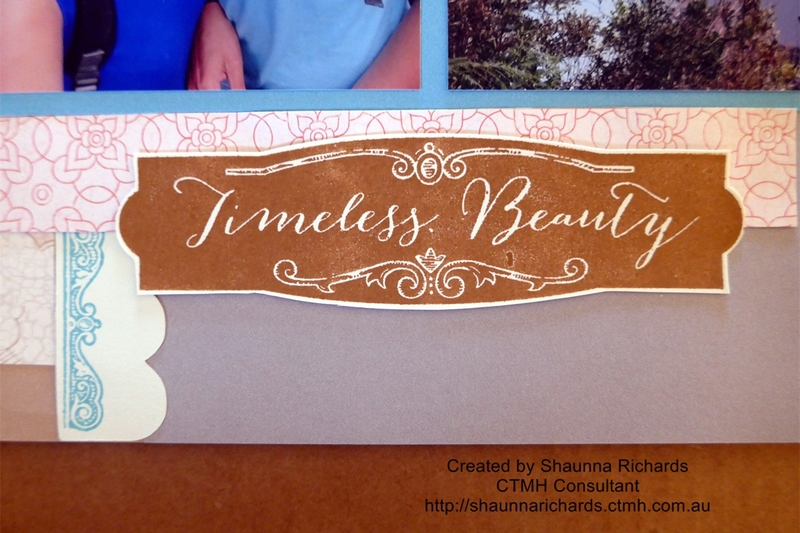 Kathryn used the Scallop Border Punch along with the border stamp for a pretty highlight on the page. Aren’t the papers so pretty? I just know this pack is going to be one of my favourites. I used the left overs from her pages to make some cards. This one is my favourite. 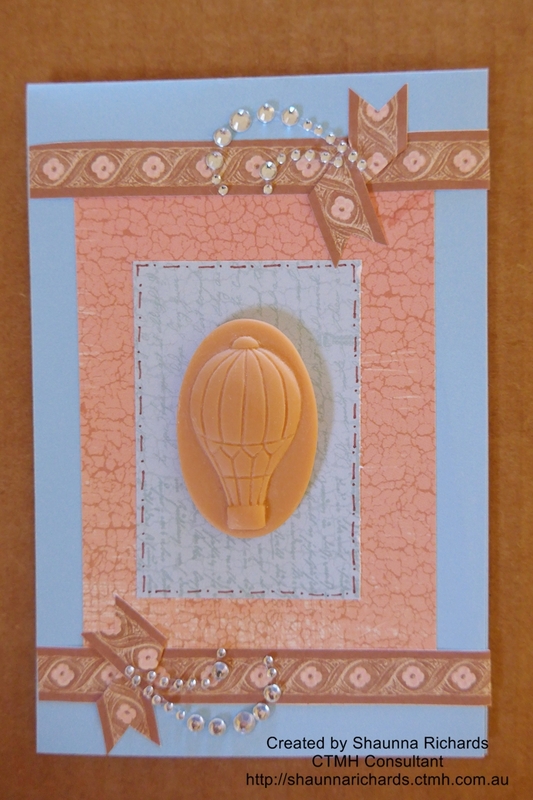 The faux cameos in the Balloon Ride Assortment add a striking decorative feature. They come with adhesive already on them and are so easy to use. I cut the zip strip from the top of the paper to look like ribbon. A gentle twist in the middle added dimension. I used Glue Dots to hold it in place and finished off with a bit of bling. I’d love you to leave a comment. 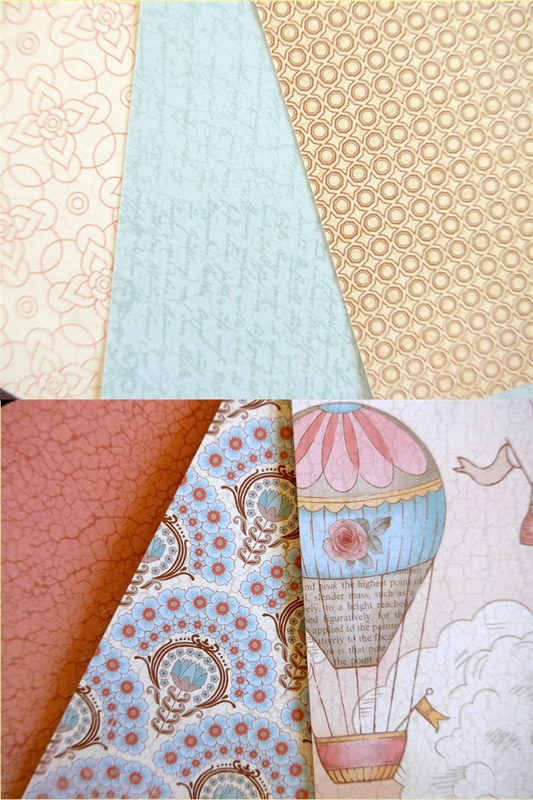 What themes would you use the Balloon Ride collection for? 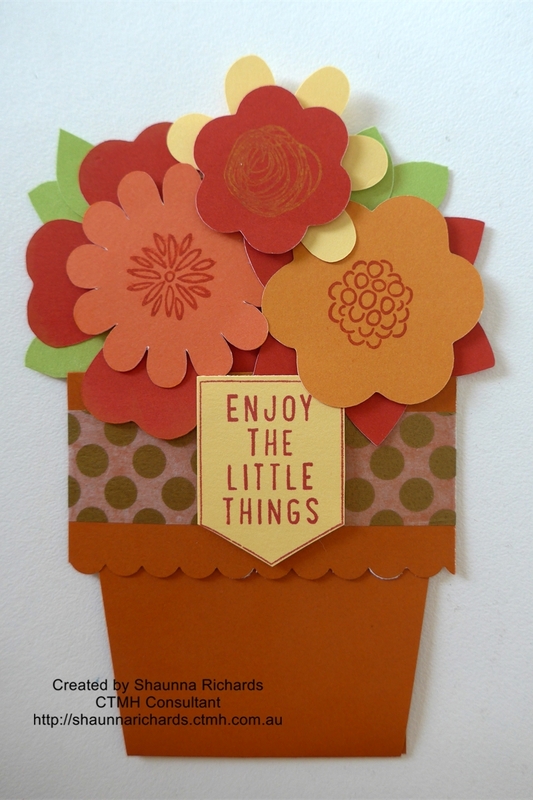 Enjoy the Little Things! What a great motto for life. We are surrounded by so many beautiful blooms in gardens and parks at the moment and this stamp set reminds me of that. 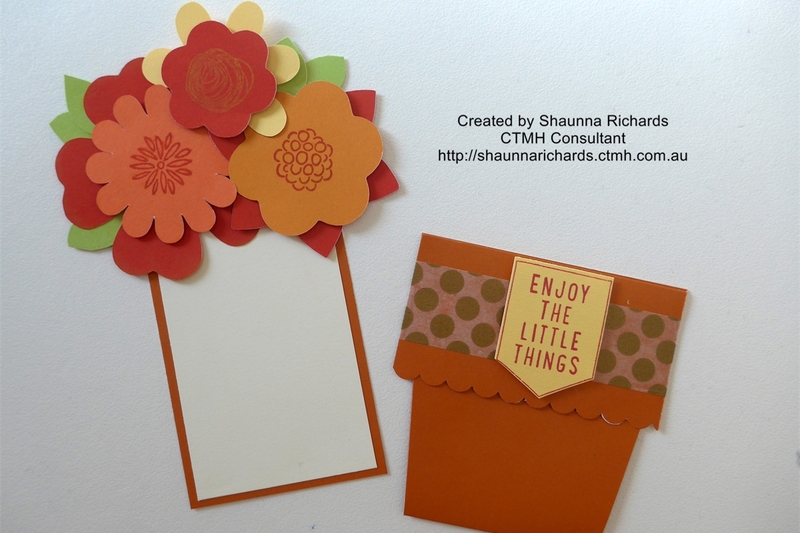 A few years ago, someone clever made a flower pot card at one of my workshops and I always planned to do one but never got around to it. I have a friend who is going through a tough time at the moment and thought this little card may brighten her day. It didn’t take long to make. I watched a video that gave me all the info I needed. You can watch it by clicking here. Basic measurements are 3 1/3″ x 9″ for pot, scored at 3 1/2″ and 7″ and the insert is 2 1/2″ x 5″. 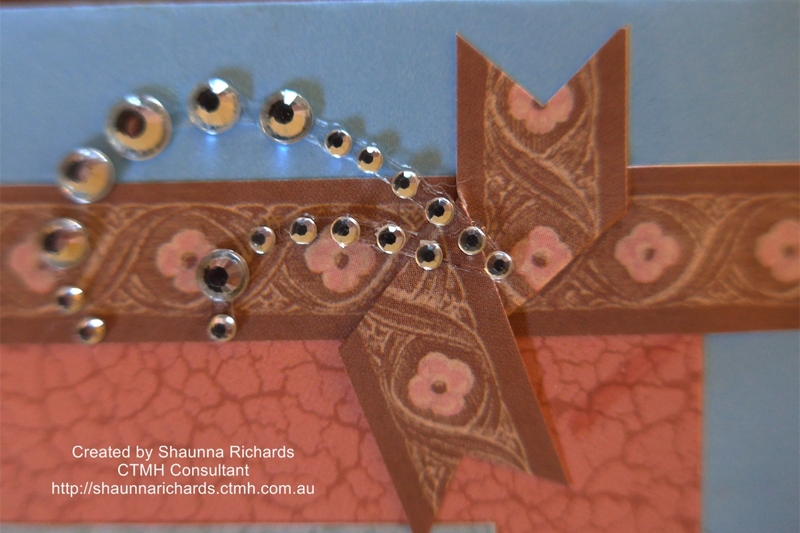 This fits Australian C6 envelopes ( The lady on the video is using American sized envelopes) The decorative edge of the pot rim was created using CTMH Scallop Border Punch (Z1851). 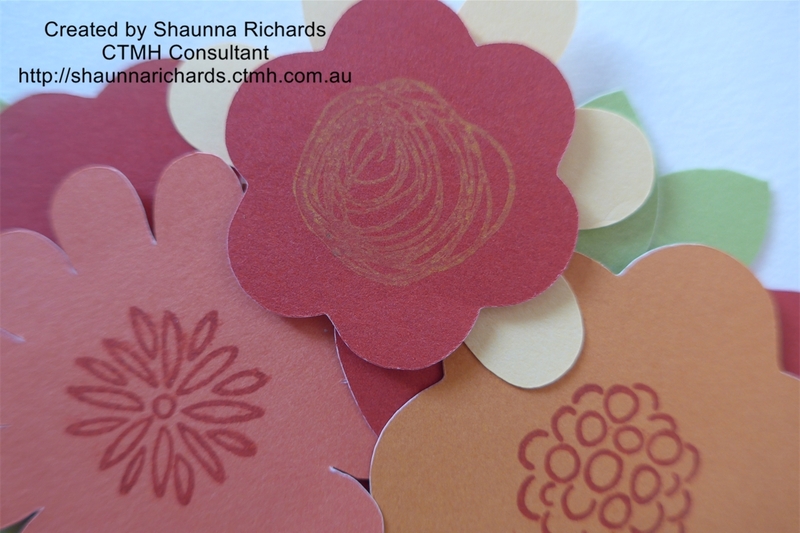 I cut my blooms using the Art Philosophy cartridge and stamped one of the images as a centre for each. I layered different sized flowers using foam dots. The leaves are cut free hand. 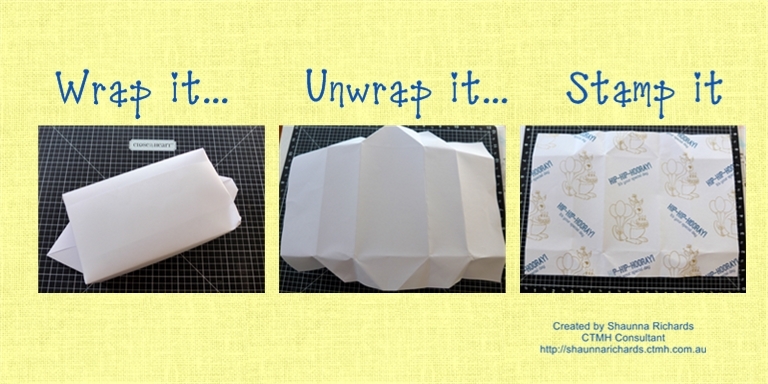 Washi Tape was perfect to hold the pot together… no need to fuss with bow tying for this one. I love the little flag that comes with this set and felt it added a nice finishing touch. 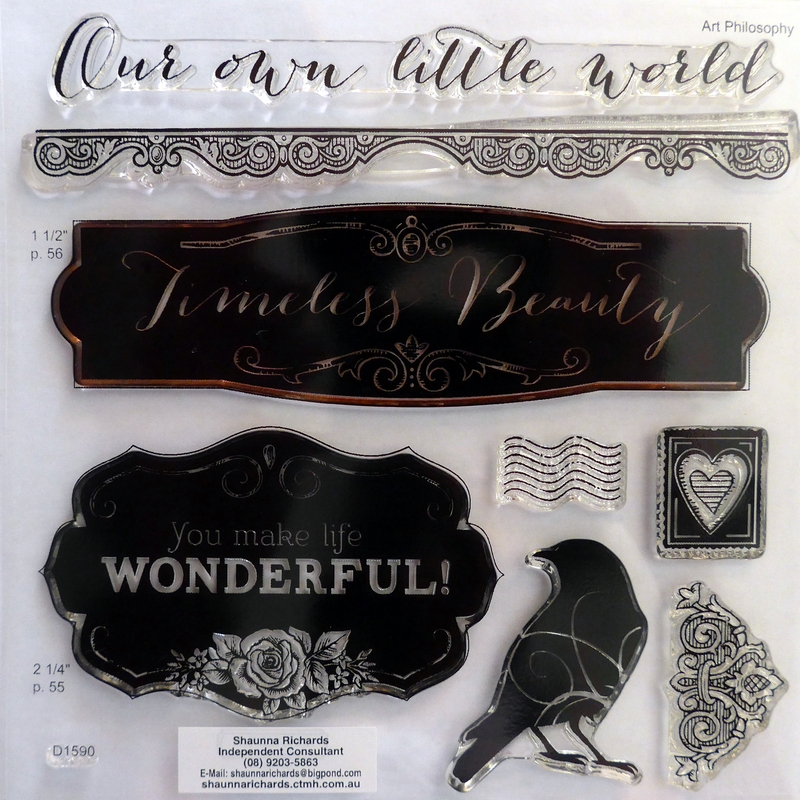 If you check out page 7 of our NEW Idea Book and Catalogue (Feb-July 2-14) you will see two gorgeous little gift bags decorated with this stamp set. I made this card to match one of the bags. 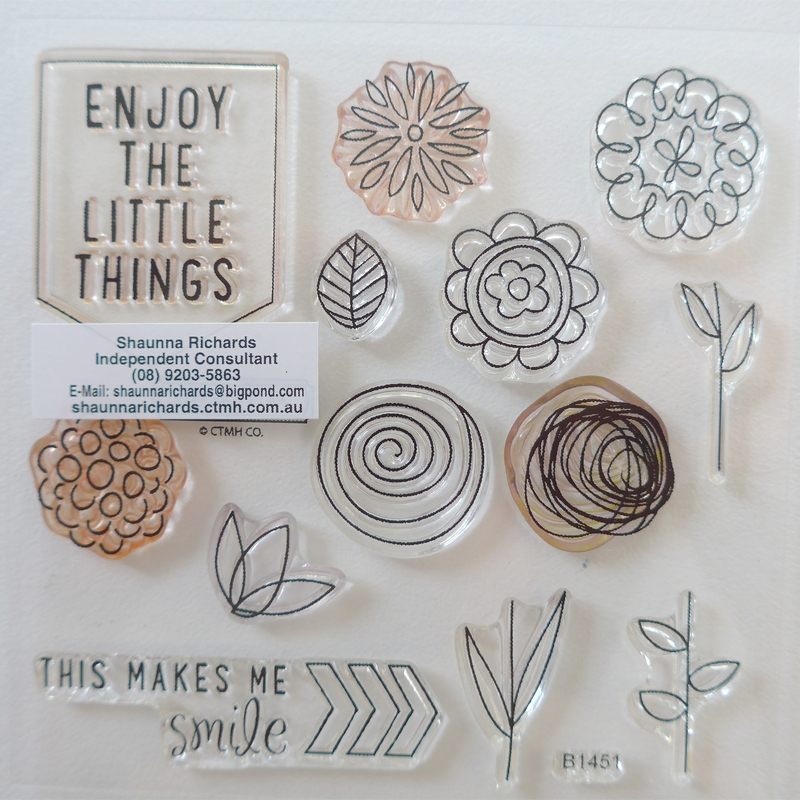 If you’d like to own an Enjoy the Little Things Stamp set it can be yours for just $8 as a hostess*. All you need are a few friends who would like to make a card, a clear dining table and me! Leave a comment or contact me to choose a date. My baby sister turned 50 last year and a celebration at the zoo was planned. It’s her favourite place to go. Unfortunately, the forecast was for rain all day so we relocated the event to my house. We wanted her to feel like she was at the zoo, so pulled out all the stuffed animals and cushions with animal motifs to scatter about! Gathering our adult children together is never easy and one was missing but we took the family photo regardless. A snapshot in time. 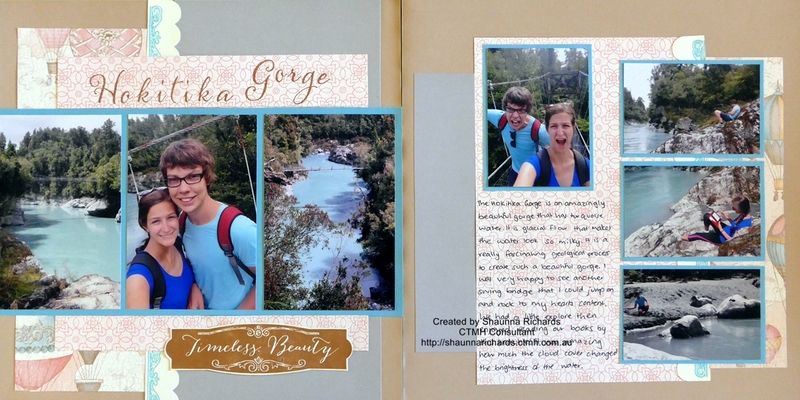 This page was based on Layout 10 in the Make It From Your Heart Vol 2 How-To Book. This book is just $10 and has saved me hours in my page making. All the layouts can adapt to different numbers and sizes of photos and are so easy to make with the page sketches and measurements provided. 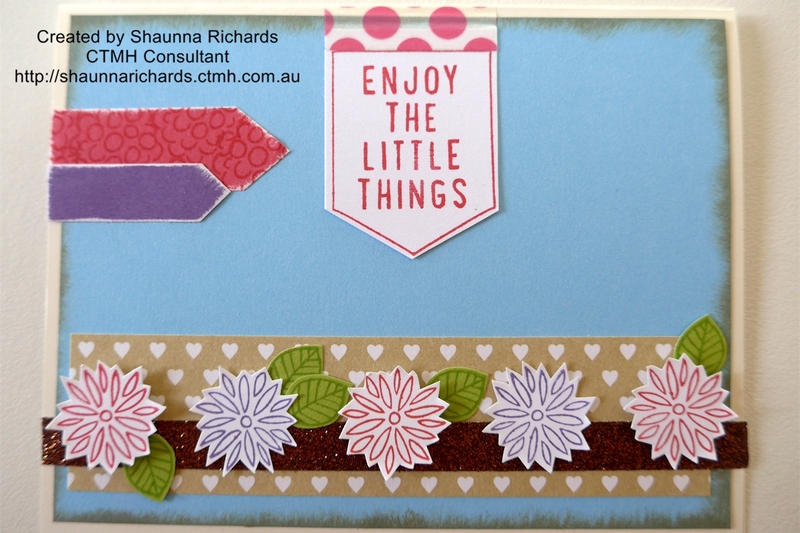 This months Stamp of the Month, Wild About Love, worked perfectly for the simple enhancements I was after. The little fox holding a flower out to my sister and the Wild Thing Title adding some fun to the page. 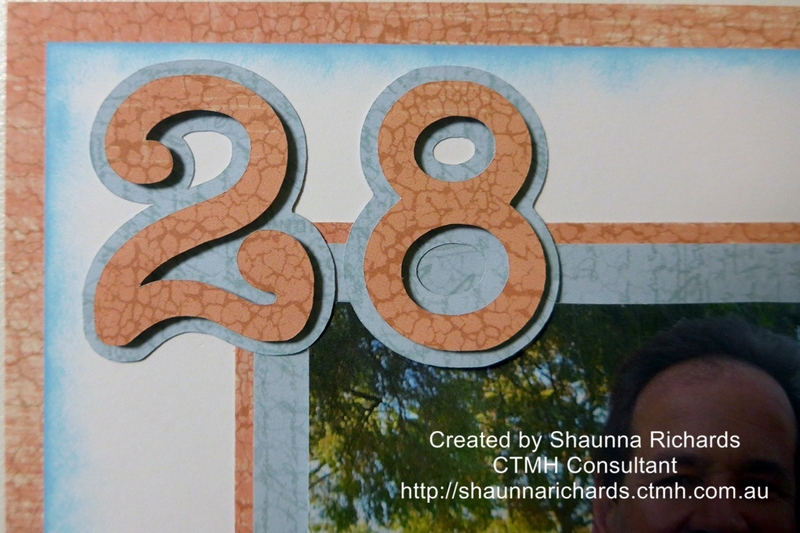 I created the circle border strip on the cricut but this could also be made using circle punches. 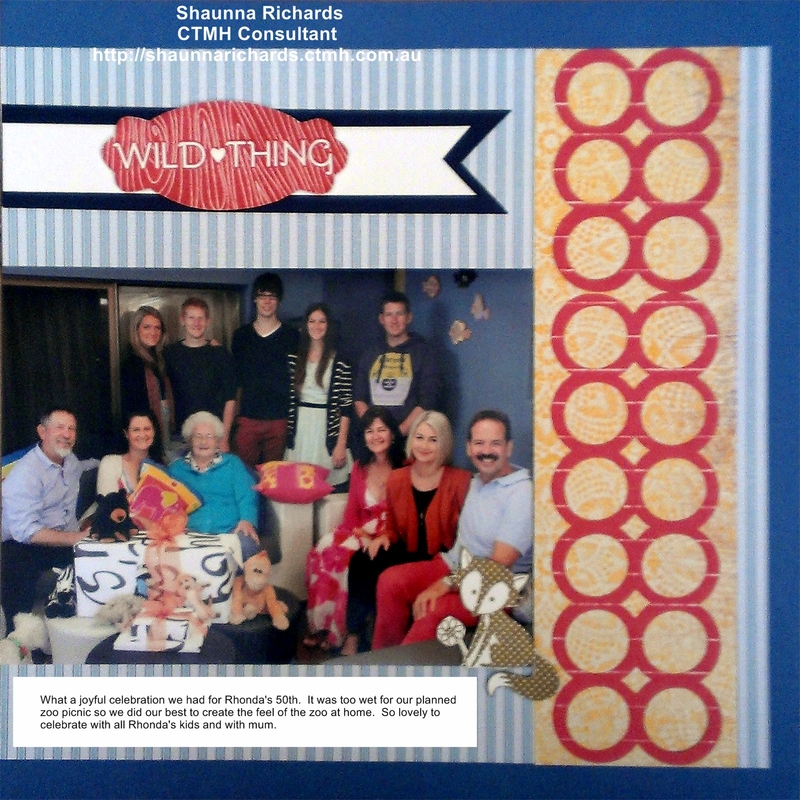 Today I would like to share a scrapbook page which features the February Stamp of the Month, Wild About Love, S1402A available exclusively throughout February for $24 or for just $5 when you spend $75. 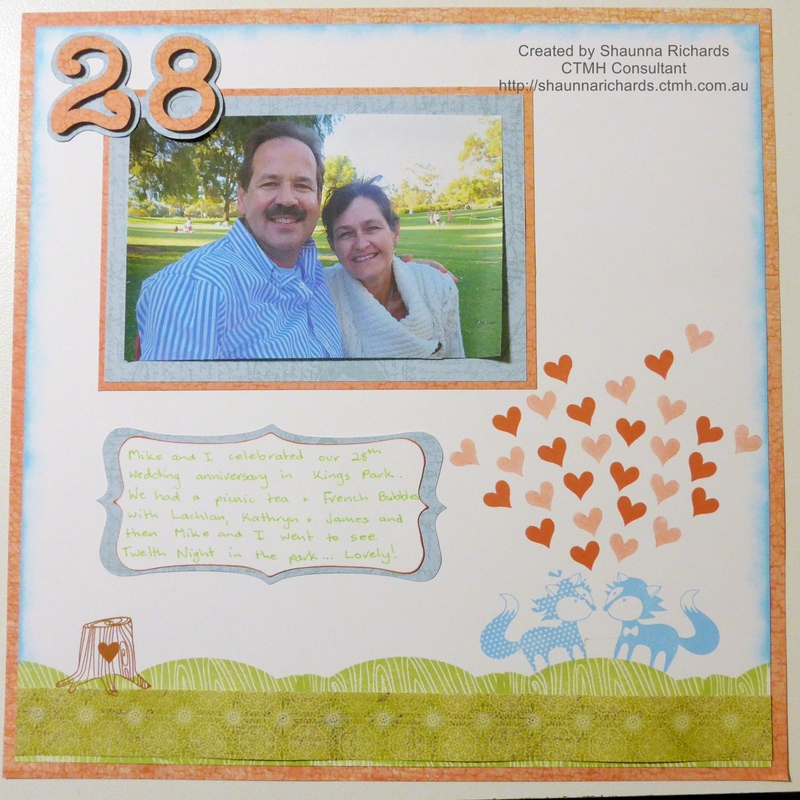 My husband and I recently celebrated our 28th wedding anniversary. Now, you would think a die hard scrap booker like myself would have been a little more pro-active in the photo taking department but we only have one photo from our ‘date’. So, I needed a layout that used up lots of free space on the page! 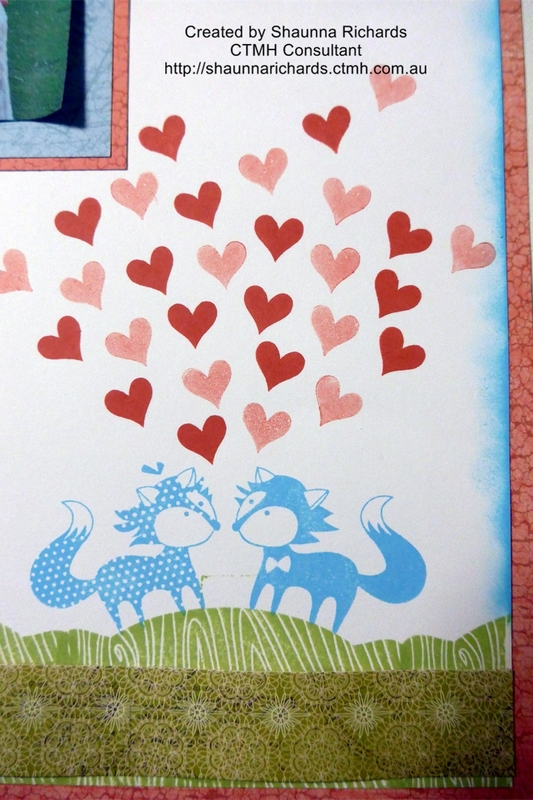 I decided to veer away from blocks of paper and use the Wild About Love stamps to enhance the story. I like to think this page represents the naïve artist within me. I chose the NEW Balloon Ride papers for their soft colours and then used matching Exclusive Inks – Sorbet, Sky, Sweet Leaf and Saddle. To begin I stamped the Wild Things title at the bottom of the page, overlapping to give the effect of undulating grass. I covered the words with a strip of co-ordinating paper. 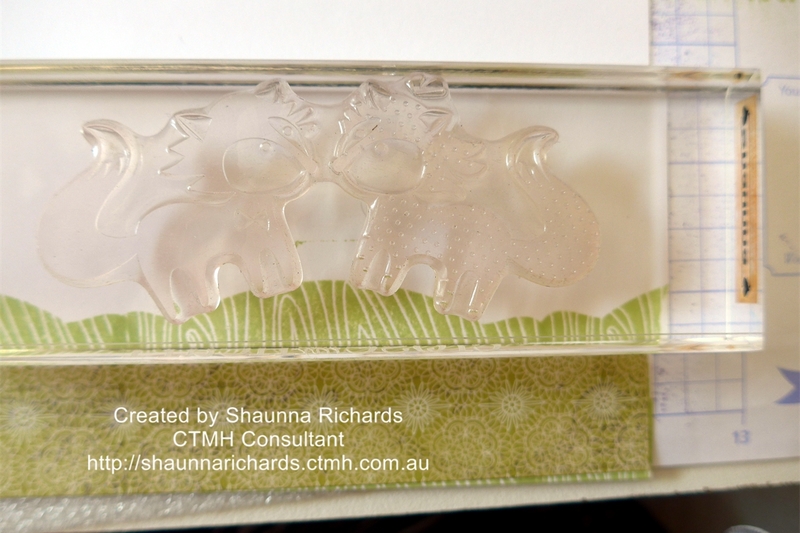 I lay my 6 1/2″ x 2″ block over the stamped image and curved the 2 foxes stamp to make it look like they were standing on the grass. The 29 love hearts (one for each year and one for good luck) were stamped in first and second generation ink. I finished it off with my numbers cut on the Cricut. 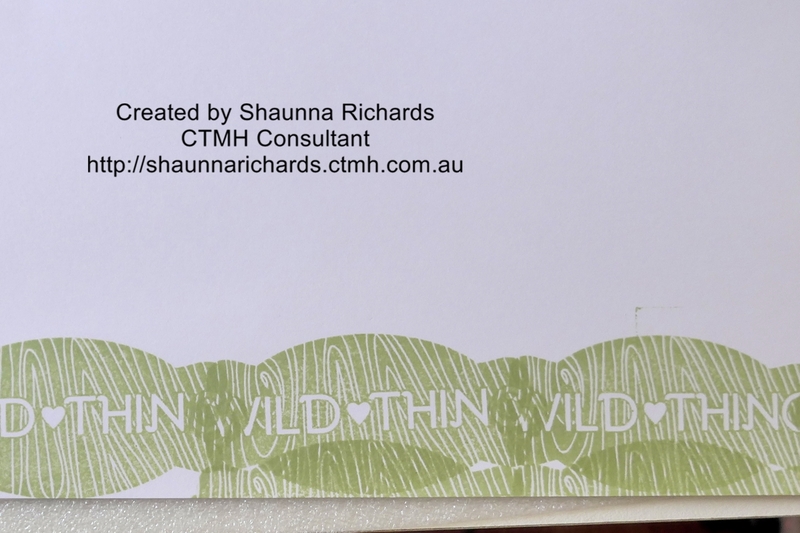 Wild About Love is only available until 28th February from your CTMH consultant. I’d love you to leave a comment before heading off to the next stop, Jo’s Blog, Jo’s Close To My Heart Classroom.